When Dad is craving Native Foods Cafe’s, Oklahoma Bacon Burger, but knows they are what he considers toxic, a daddy’s girl like myself creates a raw version. Please let me clarify. I do not consider Native Foods toxic. I love them. My dad is just trying to heal his body with whole raw foods and has been calling anything cooked toxic. You can read more about his journey here. As I have mention in previous post, I was never a huge burger fan, and I have never tried the bacon burger mentioned above. However, this was delicious. Maybe it is the fact that it wasn’t between starchy hamburger buns, or the fact that the flavors meshed together really well. Regardless, I enjoyed this and will definitely make it again. The burger recipe would work wonderfully as a nut loaf. I dehydrated the burgers but if you don’t care about it being raw, it would be great baked at 350 degrees for a half hour. This, as most raw recipes is really easy, it just takes a bit of time, so read the directions completely before planning it for tonights dinner. Please read about my adzuki bean sprouting experience here. Mix chia seeds and water and allow to set for 15 minutes. Place all other ingredients into a food processor and turn on until mixture becomes a paste, making sure to scrape sides occasionally. Add chia seed mixture and turn processor on for 30 seconds. Scrape sides and turn on fro 30 more seconds. 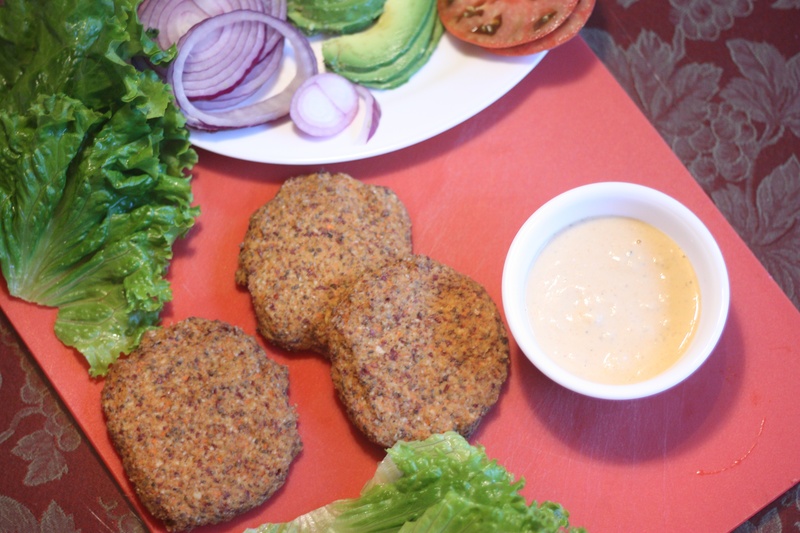 With your hands shape into the size of patties you want, making sure they are not too thick for your dehydrator. Dehydrate at 115 degrees for 4 hours or until warm and slightly crispy. The recipe yielded 6 large burgers. The leftovers were great cold! Mix together in a bowl until well blended. If you would like a spicier sauce add a pinch of cayenne. 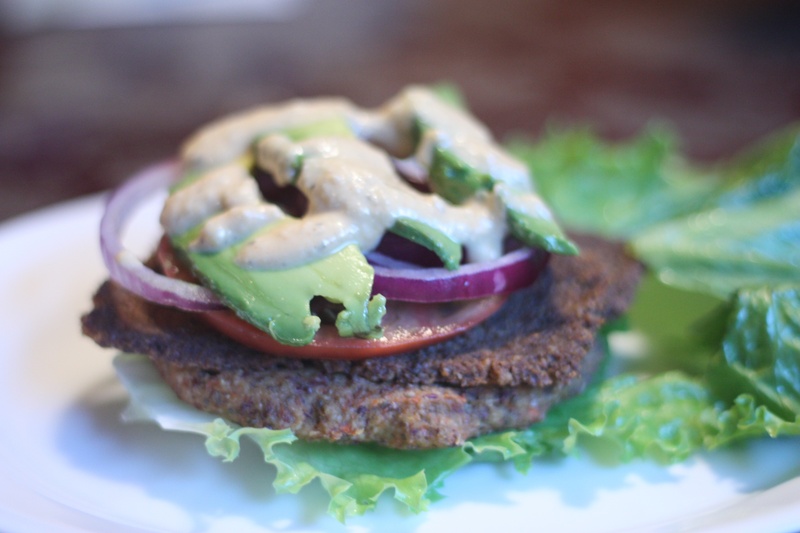 Love your burgers and would like to link to your recipe on the Vegan Mofo round up post on my blog this Friday. Hi Sandra! It would be awesome for you to share the recipe. Glad you liked it! Nice to meet you as well.